– w3.org/accessibilit y The Web is fundamentally designed to work for all people, whatever their hardware, software, language, culture, location, or physical or mental ability. When the Web meets this goal, it is accessible to people with a diverse range of hearing , movement , sight , and cognitive ability. – Aaron Gustafson (Foreword in: Sarah Horton. “A Web for Everyone.”) “On the web, every decision I make can have a profound effect on hundreds of thousands (if not millions) of people’s lives. I can make checking into a flight a breeze, or I can make it a living hell. U s e t h e w e b ? c o m p l i c a t e d.
A c c e s s i bil i t y? w e b s i t e i s a c c e s s i b l e ? B a c k e n d i s a c c e s s i b l e ? a c c e s s i b l e ? 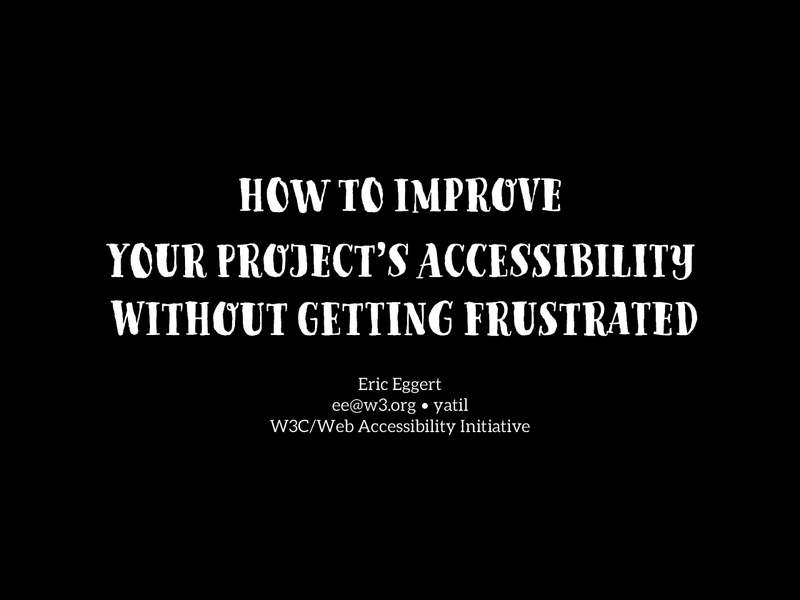 View How to Improve Your Project’s Accessibility Without Getting Frustrated. Note: The original title of this presentation used an ableist word. The title on the first slide has been changed to reflect this change in my awareness.